In 1985, Dennis Quaid and Louis Gossett, Jr., found themselves marooned on an alien planet where they were forced to rely on each other to survive. Also, Gossett was an alien and the two hated each other courtesy of a galactic war between humans and Gossett’s alien race. Enemy Mine took the plot point of forcing enemies to help each other and placed it in a science fiction environment. It was not the first to do so, either, and as Rebels revealed in “The Honorable Ones,” it will not be the last. Rebels also proved that an old trope can easily be dusted off for an excellent episode. “The Honorable Ones” begins with the crew of the Ghost returning to a planet best known from Attack of the Clones, Geonosis. The red desert-like planet, something of a stand in for Edgar Rice Burrough’s Mars, was home to green bug-like aliens and also the first glimpse of the potential superweapon, the Death Star. Decades after Anakin, Padme, and Obi-Wan, fought against monsters in an arena, our rebels arrive to discover two things. First, a vast orbiting construction yard floating over the planet, but the subject of that building project absent. Second, the planet is lifeless. The rebels have little time to contemplate either before it’s discovered that the information which brought them to Geonosis in the first place was simply bait in a trap. Awaiting for the rebels behind closed doors on the construction platform is Agent Kallus and plenty of headache inducing Stormtroopers. In the fight that follows, Zeb is separated from the rest of the team and forced to find an alternative solution to escaping the station. He finds an escape pod and in the process of departing, Kallus hops into the craft and continues the fight. The pod ejects, but as a result of the fisticuffs between Zeb and Kallus, is knocked off course from Geonosis, instead crashing onto an ice covered moon above the desert planet. 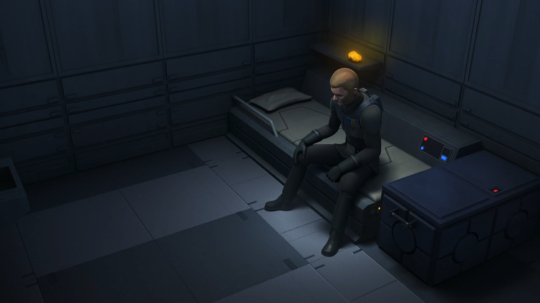 Kallus’ leg is broken, essentially putting him at the mercy of Zeb, as both try to figure out a way to survive the freezing temperatures of their surroundings. 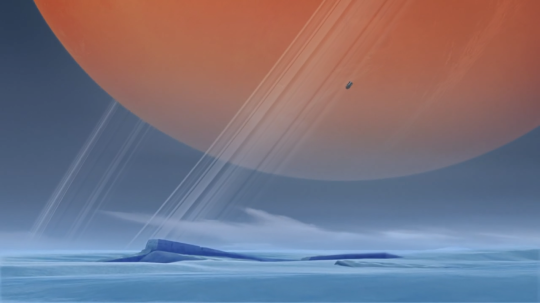 The frozen surroundings of soft blues, purples, and grays, contrasted against the pale red of Geonosis visible through a hole in the icy cave’s ceiling creates something of a retro feel to the setting of the episode. Almost immediately one can envision it lending itself to an 1950s era style travel poster. The pair are not alone for long before a giant creature appears and tries to make a meal of both, and both end up fending it off together. This helps to establish a bridge, weak most definitely, between the two to explore each other’s personalities and past. Likewise, one can see the cold surroundings in a physical sense of cooling down the hostilities between them, so they are not simply focused on killing the other. Their past, after all, on Rebels has not been a good one. 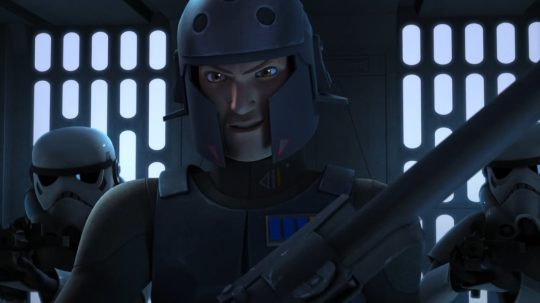 It was not long into Season One of Rebels that Agent Kallus was introduced, and almost at the same time, it was revealed he wielded a Lasat weapon similar to Zeb’s, a type of bow rifle that only the Lasat Honor Guard carried. Immediately, this placed Kallus in the position of having participated in the genocide of Zeb’s people. This genocide unsurprisingly comes to the forefront of Zeb’s and Kallus’ conversation on the moon, lead in by the mysterious fate of the Geonosians. For those who have been reading the Marvel Comics series Vader, issue four revealed that sometime after the Clone Wars, the Empire bombed and sterilized the planet to make for easier access to its minerals. It’s a barbaric act, one which Kallus admits to having no knowledge of, presenting the situation that Kallus purposefully chose not to investigate the darker behavior of the military power he serves. 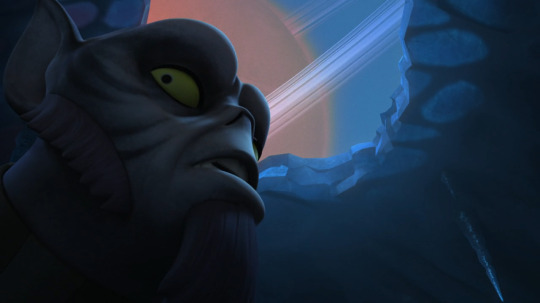 Following “Homecoming,” it would not be surprising to see “The Honorable Ones” as another wonderful opportunity for providing more characterization of Zeb, who earlier benefited from “The Legends of the Lasat.” However, in a sly move, “The Honorable Ones” is truly an episode more about Kallus than it is about Zeb. Kallus early into the marooning on the moon tries to convince Zeb to simply surrender and become his prisoner and promises him a trial. It’s clear that Kallus believes a trial would await Zeb, but in turn, Zeb makes it also abundantly clear that he knows there would be no trial, just execution. This sets up Kallus as something akin to a true believer in the Empire, for all that it does that might appear wrong, it’s still a force for good in the galaxy. 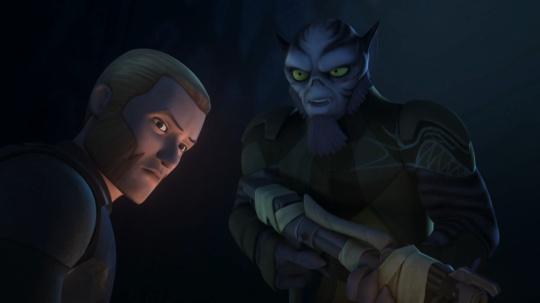 Prompted by Zeb accusing him of having the bow rifle as a trophy, Kallus explains that it was given to him by a Lasat Honor Guardsman, which Zeb clarifies for the audience as an act of the Lasat Warrior War – giving one’s weapon to a superior warrior. We then delve deeper into Kallus’ past as he relates the story of his first deployment to a planet called Onderon. Described as a ‘troubled’ planet, Kallus tells Zeb he saw himself and his fellow Imperial soldiers as a force to bring peace. On a note, Onderon and the name Saw Gererra are both references from The Clone Wars, which featured both on numerous occasions. It was on a routine patrol that he met his first Lasat, part of a rebel group which ambushed him and his comrades. Then, to a solemn expression wearing Zeb, Kallus recounts how the Lasat mercenary calmly executed the wounded who had survived the initial attack. 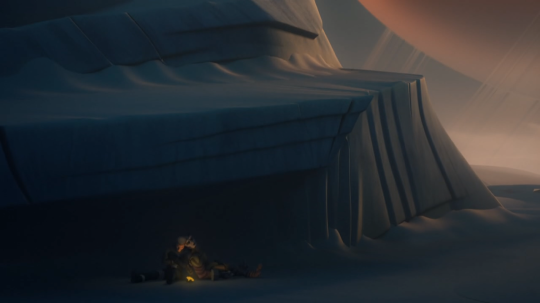 As described by Kallus, it’s a grim story, and illuminated by a glowing rock in the shadowy darkness of the ice cavern, invokes a sense of a scary story told around a campfire. Upon its conclusion, Zeb comments that not all Lasat are the same, an observation that Kallus turns around on Zeb concerning Imperials. Zeb dismisses it gruffly. After another close encounter with more ice beasts, the pair make it to the surface of the ice moon and find cover in a cave. A transponder hefted from the escape pod and tuned by Zeb to reach his friends exists as their only hope for rescue, though Kallus shows repeatedly a lack of belief that the rebels will return for their comrade. Interestingly, after Zeb claims that they will come, unless the Empire finds them first, we get a quick cut to Kallus and for a brief moment, entirely through his facial expressions, it’s broadcasted that Kallus knows the Empire isn’t coming for him. Kallus then brings up the massacre on Lasan once more, and tells Zeb that it was never the intention to kill his people, but merely to make an example. He then offers something of an apology and on that note, the two fall asleep. The next morning the Ghost arrives and Zeb chooses to leave Kallus, rather than take him prisoner, at the Imperial agent’s request. They depart after exchanging Lasat farewell hand gestures. Zeb’s reunion with his friends is almost immediately played in contrast to Kallus’ return to an Imperial ship. Everyone on the Ghost announce how worried they were for him and how happy they are to have found their friend. We cut away to a star destroyer and blast doors which open at the end of a hallway to reveal Kallus, by himself, holding a warm glowing rock which had kept him and Zeb alive. He’s still injured and limping through the hallways, alone and turns the corner to run into Admiral Konstantine. The admiral barely looks up from a data pad, acknowledging Kallus, before proceeding on his way, leaving Kallus to momentarily hang his head before moving on. We follow Kallus to his quarters, a gray, Spartan-like arrangement of a room. It resembles something more like a prison cell with the only adornment now his glowing rock, which Kallus places on a shelf beside his bed, before the camera pulls away to emphasize how alone he is within a ship full of hundreds, if not thousands of Imperials. It’s a devious conclusion to “The Honorable Ones,” planting suspicions that Kallus may be at the precipice of disillusionment with the government he has served for years. “The Honorable Ones” arguably arrives in time to one up the excellent episode that preceded it, “Homecoming.” It achieves this feat even more by drawing upon a very long used trope of throwing enemies together and forcing them to rely upon each other to survive. Everything about “The Honorable Ones,” at a distant glance would prepare a viewer for a mediocre outing from Rebels given its synopsis. However, the episode achieves the unexpected through several routes. It chose an excellent setting in the icy moon of Geonosis, removing all surrounding distractions from the conversations between Zeb and Kallus by muting the background in ice, snow, and darkness. It also surprised us by making the episode much more about Kallus, providing a depth to his character that had been missing for a season and a half of Rebels. Finally, whereas “Homecoming” opted to find a happy resolution to the conflict and end on that note, “The Honorable Ones,” instead chose something much more melancholy. Everyone survives their ordeal, but rather than focus on Zeb’s loving reunion with his friends, the episode instead focused on the more somber return to service awaiting Kallus on his star destroyer. He’s not missed by his fellow crew and our last shot of the episode shows him to be quite assuredly alone, in a life that he may just now be realizing resembles something more akin to a prison than a profession.